For those of you who are overwhelmed by looking through the HIMSS18 session schedule (and those of you who have been meaning to look but haven’t gotten to it yet), here’s Chilmark Research’s short list of sessions we expect to be worthwhile, as chosen by our analyst team. It is by no means an exhaustive list, but will hopefully steer our readers to a few quality sessions they may have otherwise overlooked or missed with how many options there are at any given time. We will likely have at least one team member at most of these sessions, so if something piques your interest, feel free to reach out to coordinate meeting at the session to discuss the topic further (email analysts directly or shannon@chilmarkresearch.com for meetings). We’d love to hear feedback on what sessions you’re excited for – feel free to leave additional suggestions in the comments. Why Attend: The application of analytics to time purchasing of medical supplies – in this case medication – is something we typically don’t cover in our own research, but is a growing consideration in the move to VBC. This session will be of interest to healthcare system CFOs and COOs that are looking to find new ways to streamline business operations and identify opportunities to reduce their unit costs of care delivery. Why attend: AI will have some of its near-term and largest impacts in radiology (lines at RSNA last year were around the block). This session will show how AI and analytics are bringing together clinicians, technologists, and data scientists to go beyond what any could do alone. Why attend: Individualized care plans are increasingly becoming a requirement for a number of state and federal value-based reform programs. This session will provide an overview of that as well as looking at how these various programs are looking at creating a longitudinal care plan across multiple settings of care. Why attend: The shift to home-based care is going to be an important part of value-based care especially since CMS’ decision to reimburse providers for remote patient monitoring as of January 1st. This session presents two Davies award winners and how they used home-based IT including remote patient-monitoring to improve the quality of care while reducing costs. Why attend: Healthcare organizations cannot identify actionable strategies and tactics for improving patient engagement without hearing from patients firsthand about their experiences within the system – both good and bad. In this session, two patients will discuss their personal experiences and also share tips to help HCOs raise patients’ voices and even compensate them for sharing their time and expertise. Why attend: Effective telehealth implementation requires significant strategic planning; otherwise, solutions are deployed on an ad hoc basis, different business units adopt different strategies and tactics, and scaling a telehealth program becomes increasingly difficult. This session covers the ins and outs of planning for a telehealth program — and then scaling it across a network of hospitals. Why attend: IHIE is probably the foremost exchange organization in the U.S. and understands how efforts like CommonWell and Carequality can help move the needle on exchange. Why attend: We expect this will provide a good overview of how FHIR will simplify the mechanics of data exchange and reduce the learning curve for developers. Why attend: Caravan Health has an unique model for establishing ACOs, as discussed in last March’s Vendors Enabling the ACO Report. Learning from their experiences working with smaller, rural providers to establish cross-state MSSP ACOs will highlight some of the unique problems facing more loosely organized ACOs (opposed to IDN-based ACOs). Furthermore, MIPS is generally pretty confusing to a lot of people in the industry, and this session should help clarify some of that confusion to give ideas on how to adjust strategy for success. Why attend: What happens post-discharge has broad implications for how well providers can do in risk sharing contracts. Hopefully, this will provide some ideas on how these under-technologied providers can participate more fully. Why attend: Getting payers and providers to see eye-to-eye on information sharing is not easy. DaVinci is trying to reduce the need for participants to reinvent wheels. Why attend: Convergence among healthcare stakeholders has been taking many forms, as covered in our inaugural Convergence conference (session recordings) in October 2017. This session looks at some of the organizations taking lead on implementing these new types of business models, sharing their lessons learned to help others that are entering this revamp cycle. Why attend: As AI gains in healthcare, the hype grows as well. This session will discuss survey results of Learning Health System initiatives organizations and their vendors regarding their opinions of where AI will have its greatest effect, how these solutions are being sourced, and to what degree they would allow AI systems to influence their own treatment. 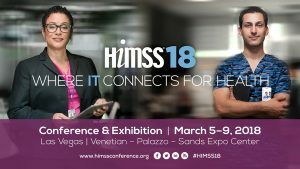 Why attend: HIMSS Social Media Ambassadors are selected based on their ability to influence industry discourse, identify emerging technologies, amplify awareness of health IT’s importance, and honor those leading the effort to shift the industry’s IT priorities. Hear from Brian and the 19 other HIMSS18 Social Media Ambassadors about how social media informs and broadens their industry expertise. The EHR App Store is Open — What is on the Shelf? Why Attend: This session will discuss how EHR vendor developer programs have evolved to include App Stores, how formal they are, what types of data they allow access to, and how they handle oversight, security, and revenue sharing. It will be of interest to a growing number of EHR clients, partners, and even competitors desiring access to the “keys to the kingdom” to offer new and innovative functionality. Why attend: Learn how the new administration is using IT to manage CMS offerings and services. Hear first hand from the organization’s top executive what to expect from the nation’s largest payer in the next couple years. Why attend: If you’re curious about blockchain in healthcare, this is the panel for you. Expect a good overview of applications and uses in healthcare today, what’s actually possible, and where this technology could be applied near term for most impact. Definitely bring your tough questions as this session is loaded with experts.